Locals like to keep the Yuraygir Coastal Walk a closely guarded secret, and it’s no wonder once you discover its spectacular beaches, picturesque lagoons and the relaxed charm and character of its coastal villages. The Yuraygir Coastal Walk begins at Iluka and Yamba, two settlements that hug either side of the majestic Clarence River. The walk throws a variety of experiences at you including coastal hiking, littoral rainforests, paperbark swamps, colourful heathlands, crystal clear creeks and lagoons and spectacular rock platforms. Graceful pandanus trees line the picture-perfect beaches on the longest stretch of protected coastline in New South Wales. This coastline is punctuated with splendid rivers making access difficult, but we have arranged for boats to take you safely across. We have also allowed time each day to take a swim or just hang out on your own private stretch of untouched beach. As an added bonus, the walk links the picturesque villages of Yamba, Angourie, Brooms Head, Sandon River, Minnie Water, Wooli and Red Rock giving it a real inn-to-inn feel. This is a track less-walked, and it’s likely that you will have it to yourself. Start in Ballina where you will be transferred to Yamba in preparation for the first day of walking. If you came by car simply start in Yamba. If you arrive early enough you’ll have time to cruise across the river by ferry (at a cost of $8.50) to explore Iluka and the surrounding area. Commence the Yuraygir Coastal Walk heading south from Angourie Surf reserve via Lake Arragan and Shelley Beach to Brooms Head. Walk across a series of rock platforms and along pristine untouched beaches. There’s an abundance of beautiful wildflowers and diverse range of other flora like Pandanuses that frame this walk every day. When walking from Brooms Head to Minnie Waters you can stop to swim and enjoy the remoteness of this magnificent park. Character filled walking including heathland plains, long sandy beaches, tranquil creeks and rocky outcrops. Today we get to experience the first of the beautiful river crossings. Tramp from Minnie Waters to Wooli with over 14km of easy walking. See if you can spot the endangered Coastal Emu and the whales and dolphins out to sea that frequent this area. Traverse 5km of rock platform as you walk from Wooli to Red Rock. This is the most remote section of the walk and a great place to pick a spot and relax. It also includes two picturesque river crossings that complete the Yuraygir Coastal Walk, a superb ending to a memorable walk. Breakfast and transfer to Coffs Harbour, Ballina Byron Airport or back to your car at Yamba. 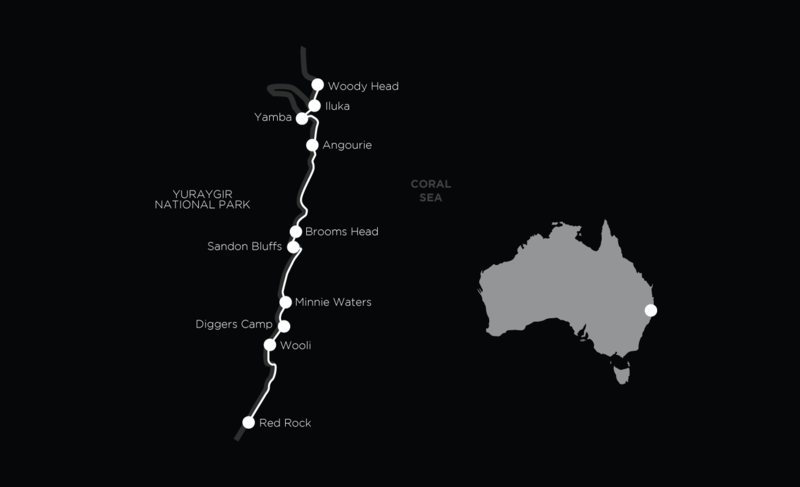 The Yuraygir Coastal Walk tracks are reasonably well graded and are easy to negotiate. Full day walks average about 16km. This linear coastal walk is a great opportunity for walkers to relax and walk, but also for walkers to challenge themselves if they wish. The two course a la carte dinners and cooked breakfasts are mostly prepared by professional chefs. Each day whilst you’re walking you’ll be provided with a substantial Walkers Lunch and get to eat it at a fabulous location on the track. A Walkers Lunch is varied and may include a high protein type salad, roll or a wrap, muesli bar, cake or muffin and a piece of fruit. As always, Auswalk supports the local economy and are fully supported by Parks NSW. This 6-day self-guided walking holiday starts in Ballina and has you transferred to Yamba and finishes in Coffs Harbour. Inexpensive flights are available from both Melbourne and Sydney with Jetstar and Virgin. From Brisbane or the Gold Coast, it is about three hours by car, a bit longer by bus, to Yamba the start of the walk. On return, there are flights or buses out of Coffs Harbour, or if you have travelled to the walk by car you will be transferred back to your car at Yamba. This walk covers more than 60km distance averaging just over 15km per day. The walking is mostly easy to moderate. There is some extended beach walking on sand and undulating tracks. The walk is a relatively easy and allows for plenty of time to explore the region or simply stay and explore the coast yourself. This walk is available from May through to October (April and November if you’re prepared to walk in a little heat). See the Bureau of Meteorology’s Yamba information about average temperatures and rainfall at different times of the year. This walking holiday includes some sections of beach walking, so we need to take into account the tide times when choosing a starting date. Check the tide charts online at the Bureau of Meteorology and select the pin for North West Solitary Island or Yamba. Please contact us in the office if you require assistance.